Agate is one of the most varied and desired forms of chalcedony. Chalcedony is one of the many varieties of quartz. Quartz may be scientifically classified either as cryptocystalline or microcrystalline. Quartz has a hardness of 7. Quartz, in all its forms, is the single most abundant mineral on earth, making up almost 12% of the earth's crust. Macrocrystalline quartz: In examples such as amethyst,citrine, rutilated quartz, clear or smoky quartz. The individual quartz crystals can be seen with the naked eye. (sometimes called cryptocrystalline)Examples of this type of quartz are agate and other forms of chalcedony, such as chrysoprase, jaspers and flints. In these the individual crystals are to small to be seen even under slight magnification. A large portion of the agates found around the world are found "in-site" where they were formed. The main problem with this is that once the deposit is dug out, they are gone. Many different varieties of agate are found worldwide. But major agate beds number less than a hundred. Is the name given to the beautiful chalcedony found in the alluvial gavels of the Yellowstone River and its tributaries. It is From the Pleistocene age (2,588,000 to 11,700 years BP) Found not in site, but in these gravel deposits. Scattered over a huge area encompassing thousands of square miles. The beauty of this is that they cannot be claimed, mined and dug out by a few enterprises. But will be available, in smaller numbers, to the public and collectors for many years to come. This agate could perhaps be called Yellowstone Agate. It's genesis was centered in the Yellowstone Park area. The actual tremendous volcanic activity that produced the conditions necessary for the formation of agate, spanned hundreds of miles and millions of years. Although it's genius centered in the Yellowstone Park area of Montana and Wyoming, this volcanic activity ranged from the eastern Rocky Mountain front in south-central Wyoming to the western front of the Black Hills and north across eastern Montana and into Saskatchewan and Manitoba Canada. Eastern Montana was mostly a shallow inland ocean, almost a swamp with huge forests lining it's shores and islands of volcanoes. These volcanoes put forth mountains of lava. Lava that decimated thousands of acres of mighty redwoods and sequoias for hundreds of miles around. Agates in general come in many different forms and are formed in at least five different ways. The main conditions necessary for agate formation, are the presence of silica from devitrified volcanic ash, water from rainfall or ground sources, and manganese, iron and other mineral oxides that form the bands and inclusion. After hundreds of years and layer upon layer of forests growing up and then being devistated by lava and ash. The rains came and mineral laden silica-water flowed into the cavities and pockets left by the dying trees and bubbling lava. These ingredients and shapes trapped in the cooling lava became Montana Agate . In Montana Agate the red is iron oxide and the black is manganese oxide. High-power microscopes show tracings of little canals which once admitted water containing one or more of these metals in solution. The water dried out, the canals closed so tightly that the naked eye could not see them. The fern-like effects of trees, shrubs and mountains come from the fact that these tiny canals branched out forming smaller canals from a common center. Although this type of agate ranges throughout three states A small area in Montana seems to have the best of this agate. Found in gravel deposits in the middle and lower Yellowstone valleys. Agates are found in both the present stream bed and in gravel terraces. 10 to 15 miles either side of the Yellowstone drainage. They are nodules of gray, translucent chalcedony, which when cut and polished are seen to contain small manganese dendrites of pleasing appearance. Moss agates are popular recreation for amateur collectors and lapidaries, and are sold and traded in considerable numbers as semiprecious gem stones for use in jewelry and decoration. Their hardness requires a diamond-beaded blade for successful cutting. 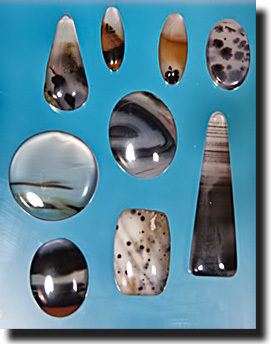 Agates have increased in true and aesthetic value. They are becoming more scarce. But spring rains and run-off conditions Turn up new agates in the gravel beds and hillsides around Forsyth most every year. I had a young fellow ask me if he could find Montana moss agate in Minnesota. Of course I told him if you don't find it in Montana you can't call it Montana agate. I also told him that I had some nice little agates from Sweet Water, Wyoming that look a lot like Montana Moss. Of course they are called Sweet Water Agates, not Montana Moss. There is a Russian moss agate similar to the Montana agate. It is translucent, with fern patterns and white and/or yellow spots that form miniature forest scenes. My father told me his dad and a friend collected agates in the Black Hills of South Dakota that were even prettier than Montana Moss agate. I get stones from India that are called picture agate. They look almost exactly like Montana Moss. So I would think it very possible to find a similar type of agate in Minnesota and many other places arround the world. Any kind of clearish agate can be included with oxides. The moss, dendrites and other colors form when some type of oxide or other minerals enter the agate when it is forming. Magnesium Oxide is the most common oxide to form the black moss and dendrites. Humanity has admired agates for thousands of years. In ancient times the beauty and durability of agate prompted man to use it in both practical and ornamental forms. It was believed that agate had unique properties that protected the wearer from dangers and promoted strength and healing.